Senior Care Testimonials | Home Care Services | AHI Group, Inc.
My father has been a client for a couple of years and the care has been excellent from the time that you provided only a driver through to round-the-clock in-home care. It is clear that without AHI, I would be unable to fulfill my duties as conservator and properly care for my father. …You and your staff are knowledgeable, professional and whole cheerful, [and] it is my belief that you provide the best possible in-home care available. I talked to many other attorneys and caregivers and no one else had her experience and intelligence in helping me solve my problem. This was impressive alone, but what was equally important to me was the tremendous amount of empathy she showed me and my mother. I would recommend her and her services to anyone. Care from AHI was provided in two separate counties while she was in the hospital, convalescent home and, last, during her placement at a residential senior care facility. The assigned Care Managers and direct care providers could not have been more caring or more diligent in providing the necessary care and loving support that Mom needed. … Seeing Mom being cared for in such a loving manner gave great comfort to her family during that difficult time. …They have a special way, I guess, of communicating with people who have dementia, and they have that skill, to be able to help them. So I think that’s probably the biggest thing for me and for our family and for my aunt. I would recommend AHI to anyone who calls on my experiences with them. These experiences are first class. I have encountered wonderful people.A lot of ’em have a sense of humor and that’s mighty important.They are all so anxious to make things run smoothly. Prior to finding out about AHI, I had spent many frustrating years trying to get back to good health but only getting further run down …It was good to find out about AHI and to get such a caregiver… she seems to have the particular answer and ability necessary for so many of the needs I have here. 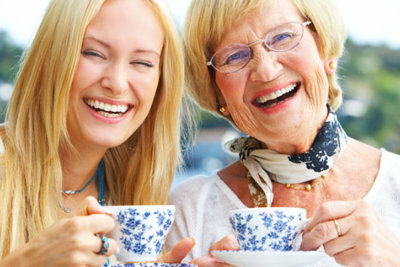 In our opinion, the two most important qualities for a caregiver are compassion and communication. If we were to grade Walter on a scale of 1 to 10, with 10 being outstanding, Walter should receive an 11 for these qualities…. And in addition, he is a great Scrabble player! I am delighted to tell you that my husband’s Caregiver is a real hero. He is so caring and gentle and is making a big difference in our daily living. He instinctively knows just what to do and takes care of our needs without being told. Some days are not easy for a patient with Parkinson’s Disease and Dementia, or for the Caregiver, but he is always there with a kind word and calming manner … Yes, he is our hero. I can’t imagine not having him as part of the family. AHI has provided companionship for my brother who suffered a brain injury and has limited abilities. The service provided by AHI has allowed my brother to enjoy a much improved quality of life. He is able to enjoy trips into the community that he would otherwise not make … AHI provides a service that truly augments what I am able to provide.